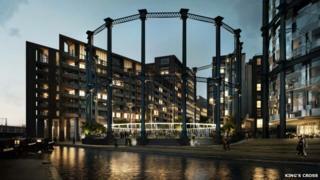 Plans have been approved for a new park in King's Cross, housed within a 19th Century gasholder. The Grade-II listed Gasholder No.8 was built in the 1850s and decommissioned in 2000. Originally located at St Pancras, it was taken apart and restored in Yorkshire in 2011, before being rebuilt at its new location north of the Regent's Canal in 2013. Work on the park is due to start shortly and it will open in 2015. The park will also provide play space for the new academy primary school next door and the co-located Frank Barnes School for Deaf Children. The gasholder was featured in the 1955 film The Ladykillers and the video for Oasis song Supersonic.